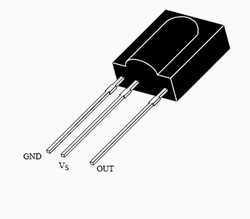 We make Infrared Transmitter circuits to generate Pulsed Infrared rays to use with IR Sensor based receivers. The IR Transmitter circuit based on IC 555 generates IR rays pulsating in the frequency typically at 38KHz. 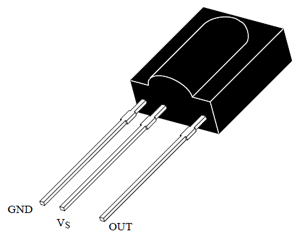 The IR Sensor used in the receiver is TSOP 1738 which also works in the same frequency. So here is a simple IR Transmitter Tester to check whether the IR Transmitter is emitting 38 KHz frequency or not. A simple circuit to test the TV remote whether it is working or not. TV remote uses Infrared LED to emit pulsed IR rays which are invisible to human eye. So it is difficult to confirm the working of IR Led of remote. 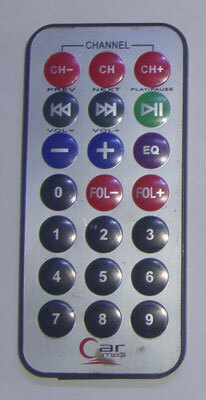 This Remote Tester blinks an LED when it receives IR rays from the TV remote. TSOP 1738 is the Infrared receiver Module widely used in remote control applications including TV. It is a versatile sensor that receives the coded Infrared pulses from the transmitter and directs the functions of the device. 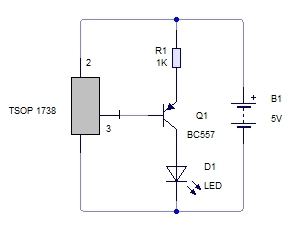 TSOP 1738 sensor is designed to receive IR rays pulsating in the 38 KHz and hence the number 1738. It has a circutry inside a black coloured filter case . 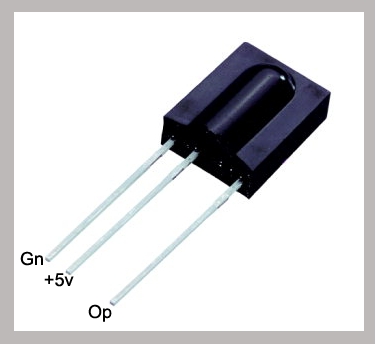 The black coloured filter case prevents the effect of sunlight and other lights on the Photodiode present inside. There is a PIN Photodide inside the module which is the receiver of the Infrared rays from the transmitter. In addition to the Photodiode, there are signal amplifier, AGC ( Automatic Gain Control), output driver etc inside the module. Remote hand sets of TV, VCD player, Home Theater system etc uses Infrared rays pulsating at 38 kHz. So in the receiver section, there is an Infrared receiver to receive the coded IR pulses. In most cases the 38 kHz IR module TSOP 1738 is used as receiver which is specific for 38bkHz IR rays. This module has a PIN photodiode and a pre amplifier stage enclosed in an epoxy case which acts as a filter and passes only IR rays. Its output is active low and gives + 5 V DC in the stand by state. The circuitry inside of the module amplifies the coded pulses from the IR transmitter. From the PIN Photodiode, the coded signals pass into an Automatic Gain Control (AGC) stage and then into a Band pass filter. Finally a Demodulator demodulates the signals and sends to the output transistor which forms the output. So when the module gets coded signals, the output transistor sinks current. Most of the consumer electronic devices use Infrared remote control for easy operation. The Carrier frequency of such remote control may be 36 kHz or 38 kHz. The Control codes are sent to the receiver of the device in Serial Format. This format is Modulated to the carrier frequency by the On / Off method. 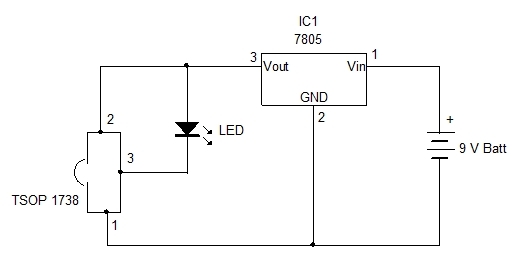 In the Remote, the IR signals are generated using an IR LED which emits Modulated IR rays. This part explains the details of IR transmission protocol and the design of IR Transmitter.